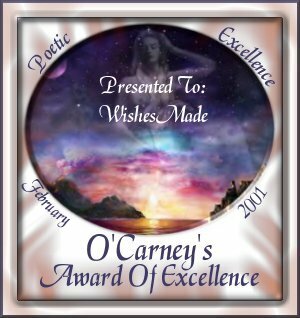 awards page to see if I have received any others. and thanks for dropping in. On a computer screen for the world to see. What exactly the beginning or end will be. Will they feel what he is trying to convey? He can't, but wants just.. to fly away. He gives the world to chase the night. Then heartbreak again, begins to bite. Knowing that there is a special person in wait. He will have finally kissed, gently his fate. to enter her site and find out just how really talented she is.